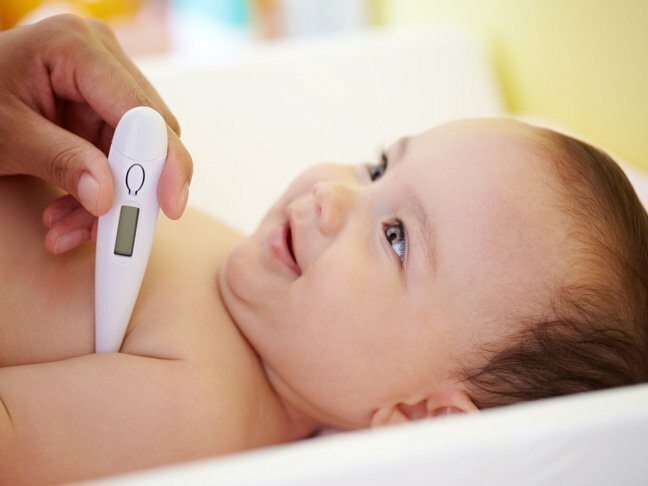 Thermometer for Fever in Children: Which Kind Is Best? It’s important to pick the right thermometer for fever, but there are lots of options out there for children. So which one is best for your child? Here, we’ll tell you about the six different kinds of thermometer for fever, and when to use them. Do electronic ear thermometers give accurate readings? Known as tympanic thermometers, this thermometer for fever uses an infrared ray to measure inside your baby’s ear canal for elevated temperature. Caveat: Electronic ear thermometers are often inaccurate for children under 3-months-old. Some children may also find that the tip of the thermometer puts uncomfortable pressure on their ear, particularly when infected. Are forehead thermometers worth the extra cost? The go-to thermometer for fever monitoring in hospitals and doctors’ offices, temporal thermometers are easy to use and comfortable for children. A simple swipe over a child’s forehead or behind their ear can give an accurate reading, even if your baby is struggling to sit still. Should a rectal thermometer be used at home? Because using a rectal thermometer is the most accurate way to read a young child’s temperature, you should become familiar with the simple, though delicate, process. Moms can safely measure their baby’s temperature with clinical precision via a rectal thermometer; just be sure to follow instructions on the package very carefully. Can digital thermometers be used underarm? Using a digital thermometer for fever gets you quick, easy-to-read results; simply place it under your child’s tongue or underarm (if your child can’t tolerate a thermometer under the tongue). While less accurate than rectal thermometers, digital thermometerd can catch extreme temperatures. Are pacifier thermometers effective for babies? Most physicians do not recommend pacifier thermometers because they’re highly inaccurate. Do plastic strip thermometers actually catch fevers? Often considered cheap and ineffective, plastic strip thermometers can still be used as a general measure for elevated temperature. Easy to keep in a wallet or purse, a strip thermometer can confirm whether a baby’s temperature is rising, even if these devices might not be reliable for an exact degree. Their results should always be double-checked with more reliable thermometers for fever. Fevers are never fun, but knowing which thermometer for fever works best for your baby can prepare you for those unexpected moments of illness. Newborn Weight Gain: Is Your Baby On The Right Track?RSV: What Is Respiratory Syncytial Virus?